Back in 1984 I was coming to the end of my art history A level and was flipping thro pictures of late C20th paintings with my art teacher and colleagues when out of the pile came a quite memorable image. It was what I called to my self 'the hedge picture'. I must have quickly forgotten who it was by, a fair indicator of my general A level performance, but I never forgot the scene, painted in bright, summery acrylic colours of a pair of tennis players playing on a lawn behind a stately home intercut with mammoth privet hedges. The players were wearing whites, in what I now understand to be likely Edwardian dress. The scene was idyllic in many ways and deeply verdant. The composition, with a large hedge in the bottom right corner, was compelling. There was also a subtle sense, I think now, of the feminine and sexual as the eye was constantly returning to the lithe, young female figure raising a raquet in the centre of the picture. My class moved on to Hockney and super-humanism and the painting, tho not forgotten, slipped to the back of my mind, occasionally remembered over the next 30 years when something hedge-like and lush revivified the memory. 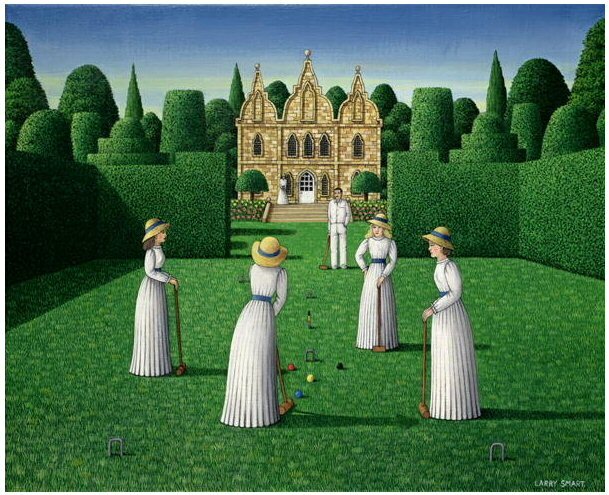 The Croquet Match, 1978, Larry Smart - i haven't been able to find a copy of the picture i describe above, this being the nearest in kind. I've recently been turning my memories out of their dusty drawers, writing an autobiography, contacting and then re-losing old friends and during this process I found myself again thinking about the hedge picture. As I say, I knew nothing of the artist at this point. I tested google with some unlikely search combinations until I eventually found a site with similar pictures on it. It was here I discovered the artist's name – Larry Smart. This was the Craig Sams site, Larry's old friend from the 60s, and from there I continued the search until I had found the Bridgeman Art collection and various other sources showing Larry's work. I discovered that there were 4 distinct phases to his painting, stretching roughly 40 years from 1965 to his death in 2005 – the early mandalas, the rock icons, the hedge pictures and the Marrakech work. As well as the visual interests posed by this kind of painting, the work was also rooted in Larry's passion for music. He had recently married singer Carol Grimes and was as interested in the rock icons of his day as anyone. He moved seamlessly from painting krishna mandalas to portraits of music legends such as Jagger, Hendrix, Plant and Dylan. The likenesses were good, the images were classic poster art, simple, almost 2 dimensional representations of man and instrument in loud colours tho the style was derivative, making a large nod in the direction of Warhol. The mandala and rock icon phases coincided with a period where Larry was hanging out with actual rock stars. He lived at Friar Park in Henley with George Harrison for a year and was commissioned to paint murals. As far as I know, these haven't been seen by the outside world in 40 years. After the glamour of the 60s and early 70s Larry moved into his hedge painting phase, visiting large houses and painting idealised scenes of lawns, topiary, cricket and croquet for owner patrons. These pictures have all but disappeared. At some point Larry visited Marrakech, a place he would return to many times in the last two decades of his life, painting pictures of ornate riads – traditional Moroccan villas – for the wealthy ex-pat gay community who holidayed there. These paintings show the great attention to detail that had been developing throughout Larry's work, with large areas of canvas covered by black and white tiling or intricate metalwork. The use of acrylics was quite masterful by this stage. The colourwork was as bright as ever, but with so much more detail the overall harmonies were impressive. Larry always loved a blue sky and Marrakech gave him the opportunity to indulge this trait to his heart's content. I don't know the art history of British or International painting since the mid 60s but it seems to me Larry Smart has been overlooked and his day in the limelight as a top British painter is overdue. His paintings were idealistic – impossibly blue skies, hedges cut into impossible shapes by archetypical gardeners who worked in the expansive grounds of large country houses for young, classy people who played tennis in full whites. It was the expression of the rock dream, that money could buy escape and happiness and yet Larry lived pretty much hand to mouth his whole life and only ever hung out with those who had achieved the dream. Larry's life is a biographical goldmine and that might make it easy to forget the happy hedgery that he painted so well. I still haven’t found a copy of that painting I saw in 84. If anyone knows where I can find one, let me know.